NM continued the tradition of sponsoring ŽKK Radivoj Korać in season 2015-2016. - Network Manager d.o.o. NM continued the tradition of sponsoring ŽKK Radivoj Korać in season 2015-2016. 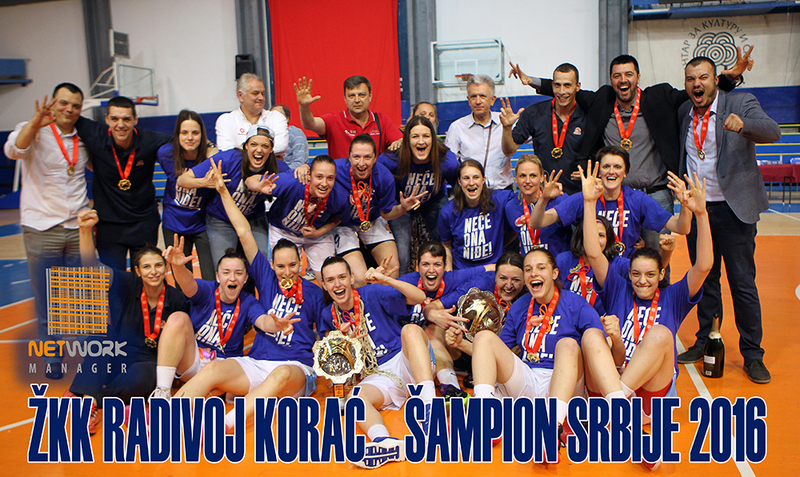 Women basketball club “Radivoj Korac” again won the title in Serbia for the season 2015-2016! Company NM has take a part in helping winning the title through sponsorship. Younger pioneers: Second place in the competition KS Belgrade. Women basketball club “Radivoj Korac” is the only team in Serbia, which has played finals in all categories and second club in women’s basketball league in the number of girls who are competing. From the season to season club successes are more and more visible. This matches with the strategy of our company who believes that systematic approach will always give results. Network Manager is glad to begin it’s global partnership with Hybroad company. NM has continued the tradition of exhibiting at the fair SCTE ECEBE 2016 in Budapest. Company NM had impressive exposure at the fair ANGA COM 2016 – (June 7 to 9 Germany). © Network Manager. All Rights Reserved 2016.